Preppers, like a lot of other communities, have specialized terms and acronyms that help us to succinctly communicate specific concepts or ideas. To those that are unfamiliar with the terms, it may seems like a closed or secret network. It’s not; we are just being concise for the sake of brevity. You are certainly welcome. And to help with these terms, please refer to the list below. Broody: The tendency of a chicken to have a strong desire to hatch eggs. Calibre: A term commonly used to describe the size of a projectile from a rifle or handgun. The calibre is the measurement, in inches or millimeters, of the inner diameter of the barrel. For example, a .22 calibre rifle measures approximately .22 inches from one side of the barrel to the other. The inner diameter of the barrel of a 9mm pistol is approximately 9mm. Carbine: Although this term is somewhat vague, it has come to mean a rifle with a relatively short barrel length and thus lighter in weight. The generally accept dividing point is 18 inches. Barrels 18 inches or shorter are considered carbines; longer barrels are called rifles. Chicken Tractor: A floorless portal chicken coop that can be used effectively house poultry. The coop can be moved daily allowing the chickens to naturally fertilize the land, eat parasites, and spread manure left by ungulates. EDC Kit: Every Day Carry Kit. A small, personalized survival kit that can be easily carried. It should be carried anytime you leave the house, not just when entering into potential survival situations. 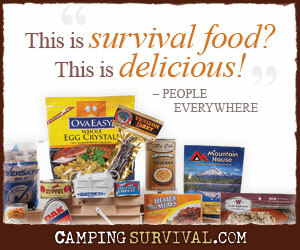 Typical contents include fire making capabilities, first aid supplies, fishing line and hooks, snare wire, a small knife, as well as other items useful in survival situations. EMP: ElectroMagnetic Pulse. An EMP can occur naturally from certain activity on the surface of the sun. The can also be created via nuclear explosions. The effects are that a brief but extremely high voltage spike will occur, rendering much of the electronics worthless. Gauge: A measurement used to communicate the potency of a shotgun. The term refers to number of lead balls the size of the inner diameter of the weapon it would take make a pound. For example, a 12-gauge shotgun means that it would take 12 lead balls that size of the inner diameter of the barrel to make one pound. Similarly 20 lead balls the size of the inner diameter of the barrel of a 20-gauge shotgun would weigh a pound. GMO: Genetically Modified Organism. The term describes an organism, such as corn or salmon, whose genetic make up has been intentionally altered by injecting portions of DNA from another organism or even species to create a whole new set of genes. Currently some GMOs are being allowed into the food supply without labeling. Kindling: Small, dry twigs and sticks used to build a fire. Kindling should be no larger than your finger. Potable: A term used to describe water that is suitable for human consumption. Sheeple: Derived from a combination of the words Sheep and People, the term denotes people who mindlessly give up their rights to others who are perceived to have some authority. Few questions are asked about the legitimacy of the requests or the trustworthiness of the authority figures leading the sheeple. TEOTWAWKI: The end of the world as we know it. This may be specific to one individual, as in the case of a job loss. It may mean a disaster on a region scale, such as an earthquake or hurricane. For many, it conveys a significant and permanent change such as the collapse of our economy or a nuclear strike on our soil. Tinder: Fine flammable material that easily catches a spark. Tinder ignites easily when exposed to an ember. Small cotton fibers or the inner bark from a cedar tree work well. Zombies: The term Zombies, Mutant Zombie Bikers, or the Living Dead, is frequently used to collectively refer to a group of people after a wide-spread TEOTWAWKI event who are, in essence, walking around already dead but just not aware of it yet. They have no hope. To them, it’s either take what they want and live an abundant if not horrific life, or die trying.